Clarksville, TN – There’s an old saying that goes ‘it’s not how you start, but how you finish’ and that adage is true almost without exception … but it doesn’t hurt to get off to a good start either. 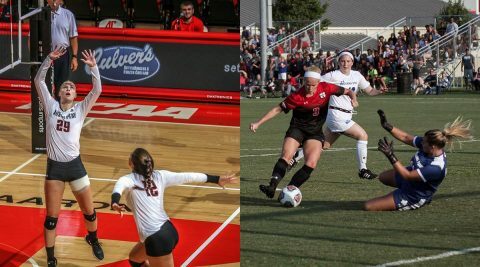 Just ask the Austin Peay State University’s volleyball and soccer teams who have both gotten off to sparking 3-1 starts to begin their respective seasons. The volleyball team came out blazing this past weekend in their own Culvers Governors Challenge winning their first three matches, including a five-set victory over nationally-ranked #19 Missouri, along with wins versus Missouri-Kansas City and Marshall before falling in their final match of the weekend to preseason number two pick in The Missouri Valley Conference University of Northern Iowa. The three wins to start the season is the best beginning to a campaign since 2008 for the Govs, with the win versus Missouri being the fifth all-time for Austin Peay versus a program from the Southeastern Conference as well as the second time (Tennessee, 2014) that they have turned the trick under coach Taylor Motts tutelage. To no one’s surprise, preseason Ohio Valley Conference First-Team pick Ashley Slay led the Governors attack with 69 kills in the four matches, averaging 4.31 kills per set, while hitting at a robust .282 kill percentage. Fellow OVC First-Team pick and defending OVC Setter of the Year Kristen Stucker helped the team post a .208 kill percentage as a team with 185 assists, which comes out to 11.56 per set. But it wasn’t just a two-person show for the Govs, with Christina White, Jenna Panning, Logan Carger, Kaylee Taff, Brooke Moore and Cecily Gable — in limited action – all have a hand in the Govs attack, which in the long run if continued help take the pressure off Slay to have to carry the load, while forcing opponents to have to account for more than just a player or two to spot the Govs offense. The soccer team just wrapped up its second week of play and after dropping its season-opening match to Chattanooga, the Govs have reeled off three straight wins versus Middle Tennessee, Western Kentucky and Lipscomb. And like last year, the Govs defense has been a big part of its quick start, only allowing two goals in its last 313:11 – including recording its first shutout of the season on Aug. 27th versus Lipscomb – while allowing only 10 overall shots per game to its opponents, with just under four of those coming on goal. Mary Parker Powell and Lindsey Todd have split time in goal and picked up wins for Austin Peay, with Powell recording the shutout in goal and posting an 80 percent save rate on shots on goal faced. While the Govs defense looks to be in mid-season form, the APSU offense has yet to hit its full stride, having not scored more than two goals in any match this season, but seeing five of its seven goals this season coming in the second half or overtime – including three game winners. Last year’s leading scorer continues to be the Govs goal leader, recording three goals in APSU’s four matches this season – including the game-winner versus Lipscomb. Renee Semaan, Claire Larose, McKenzie Dixon and Shelby Stewart also have goals this year for Austin Peay, with Dixon’s and Stewart’s goals being game winners. But while the volleyball and soccer teams have jumped out to 3-1 records this fall there will be one major difference for the pair as they move forward, with the soccer team having three of its next four matches at home before opening OVC play on September 15th versus Eastern Kentucky, while the volleyball team heads on the road the next three weeks for its next nine matches in three different tournaments before opening OVC play at home on September 22nd versus SIU Edwardsville.